The Mobile Emergency Response Plan is the new standard for Emergency Response Plans, Crisis MGT and School Safety for Higher Ed and K12. Users would be administrators, principals, incident commanders, teachers, secretaries, custodians, cooks , aides and bus drivers. 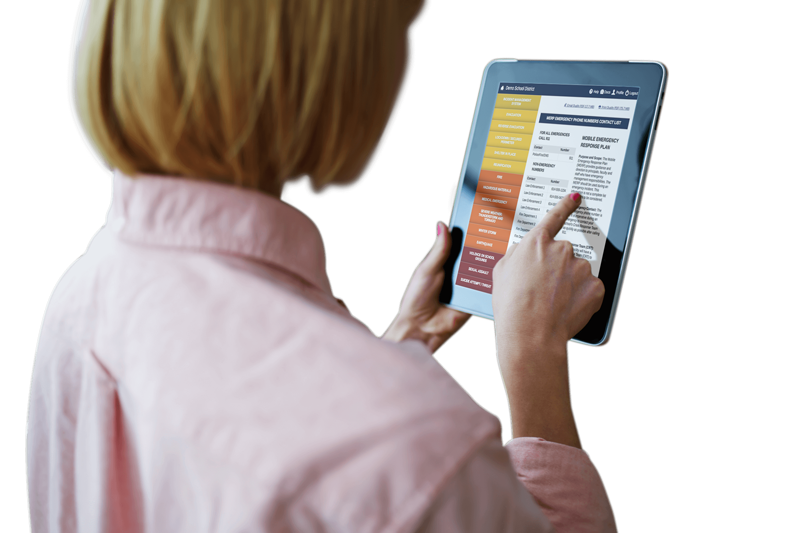 The Mobile Emergency Response Plan (MERP) allows you to take your emergency plans from the 3 ring binder in the principal’s office and put them in the hands of every employee in your organization. Imagine being able to make an update to your emergency response plan and instantly push it out to all employees and facilities with the touch of a button. MERP makes that possible. MERP comes pre-populated with an All-Hazards plan based on Best Practices. The plans are 100% editable and will be customized to your school district. MERP is designed to be a web based tool for the basis of a organization’s response to unplanned incidents. MERP holds the strategy for immediate response to an emergency, while serving as the guideline for the actions to be taken by employees in the critical first moments of an incident.